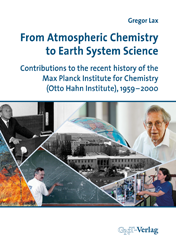 The Max Planck Institute for Chemistry (MPIC) in Mainz is one of the major pillars of atmospheric and Earth system research in the Max Planck Society and in Germany. This study provides insights in the history of establishing and developing these scientific fields at the MPIC. The book leads the reader through the re-orientation process of the institute starting in the late 1950’s until 1968 when Christian Junge was appointed as director of the new department of atmospheric chemistry, which still exists today. Furthermore, it discusses the development of Junge’s department in the context of German research in the 1970’s. There, a new integrative approach of research was established in connection to the collaborative research program 73 “atmospheric trace-gases”, sponsored by the German Research Foundation. The final chapter is subdivided into two parts and deals with the expansion of Earth system science at the MPIC after the era of Christian Junge. Part one deals with the establishment of biogeochemistry in the middle of the 1980’s under the leadership of Meinrat O. Andreae, with a focus on large-scale biomass-burning campaigns, and on feedback-loop mechanisms in the Earth system. Part two is dedicated to Nobel Laureate Paul Crutzen’s studies of the human influence on the Earth system from the early 1970’s until the year 2000, including topics such as supersonic air transport, chlorofluorocarbons, the ozone layer, nuclear winter, and the Anthropocene as a new geological epoch.